Set your Invoicing Method to "Consignment"
If those were completed successfully and you are ready to create your Pick Ticket, you should see the results! 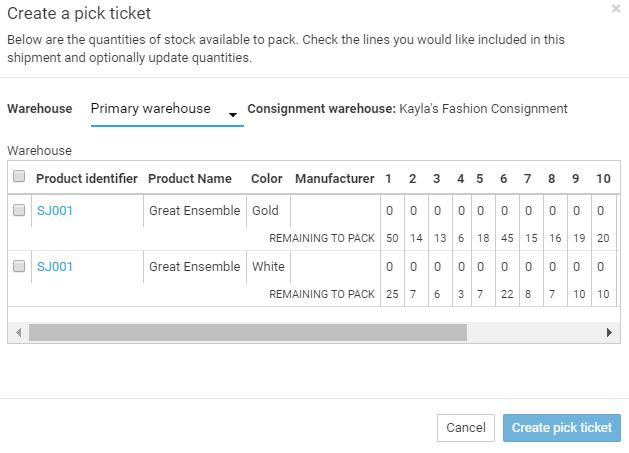 Create your Pick Ticket as you normally do on your Sales Orders by selecting "Create Pick Ticket" from the top right corner of your Sales Order. Your "Source" Warehouse is where your products will be shipped from. That displays on the left as your create your Picket Ticket. You can change that if needed. Your Destination Warehouse will be your Customer's Consignment Warehouse (defined in Step 2 above and shown on the left in Figure 1. If you do not see the "Consignment Warehouse" listed on the Create Pick Ticket screen (Figure 1), you've missed a Step in 1-4 above. Keep in mind that you can still use Consignments in the traditional sense without the Consignment Warehouse feature. You or your Buyers just will not be able to ship to the Consignment Warehouse or track inventory in the Consignment Warehouse. After you create your Pick Tickets and "Ship", they become Shipments. And, your Inventory in your Source (where product was shipped from) Warehouse will be reduced and your inventory in your Customer's Consignment Warehouse (Destination) will be increased. For more information on how inventory works with Consignments, please see our Consignment Inventory Knowledge Article.